We all know that it’s easier to turn board gamers into friends than friends into board gamers. But what if you really want to share the joy of board games with your friends? How do you get them to see the light? In my case, we had one-hour lunch breaks at work and I was getting bored of playing classic card games. The first step is to assess how much board game experience your friends have. When you ask them if they want to play a board game, do they pull out Monopoly, or do they ask if you own that “cool new game… Cat something”? My group was about 50% Monopoly, 50% Catan. Once you know how exposed to board games they are, look at your collection and find something that can draw parallels to the familiar. For a lot of people, it will be hard to grasp the idea of a board game that doesn’t involve dice. This is where Catan can come in handy. For all its flaws and over-popularity, Catan is indeed a great gateway game. Some important parallels that you can draw from Catan to Monopoly include the dice (of course), but more importantly the trades! 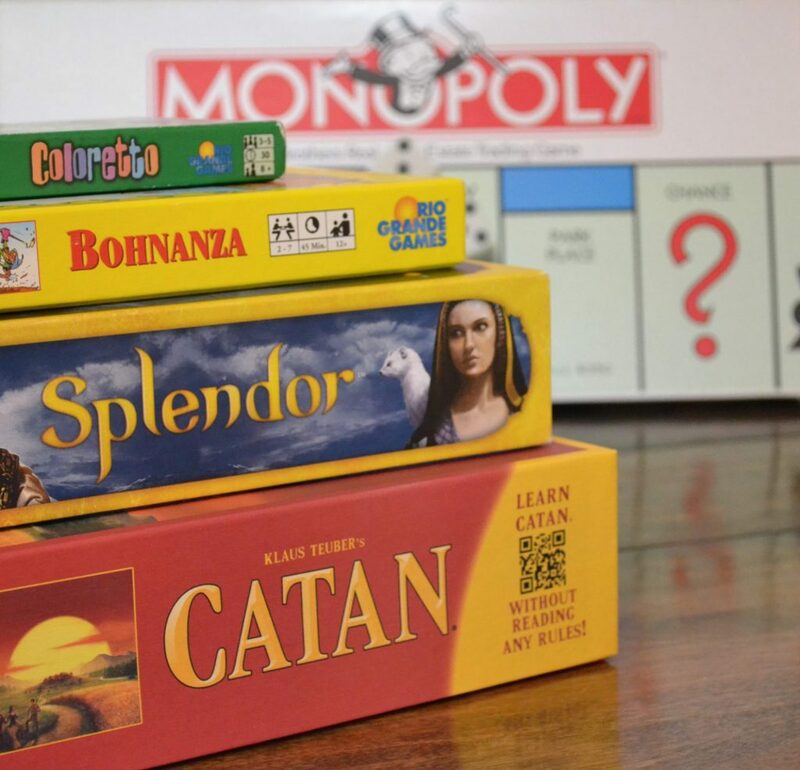 Non-board gamers are used to their only real power in board games (read: Monopoly) being that they can manipulate other players into doing what they want through trading. Some people go as far as to make real life trades for that precious Boardwalk or the famed Park Place. I know that there are some die hard Monopoly players out there saying “well you know, trading isn’t actually part of the rules,” but that’s not the point. It’s about drawing on their experiences. Catan appeals to this desire in your non-board gaming friends. 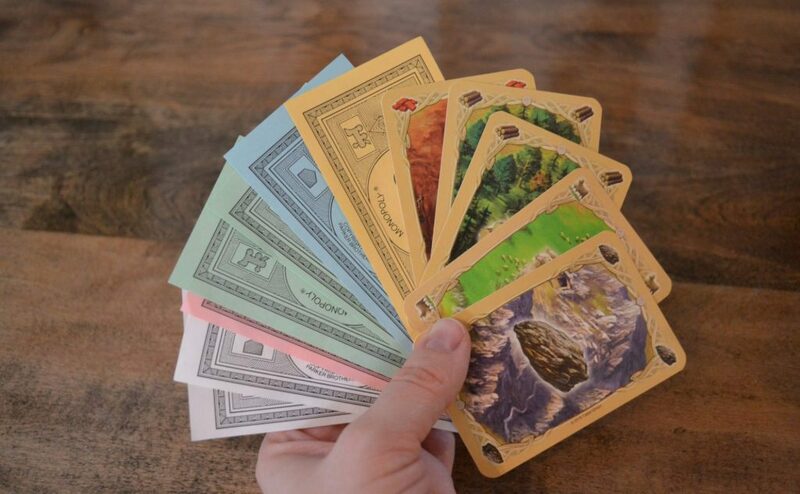 Unlike many other “modern board games” trading is part of the game’s DNA. This is something that will help them accept the world beyond Monopoly. Building hotels with money and settlements with resources is basically the same thing. Other similarities between Catan and Monopoly include paying to “upgrade” a space, and getting special cards to help you. Building settlements in Catan can be compared to building hotels in Monopoly. Both cost you money/resources but will increase your return when that space is activated. 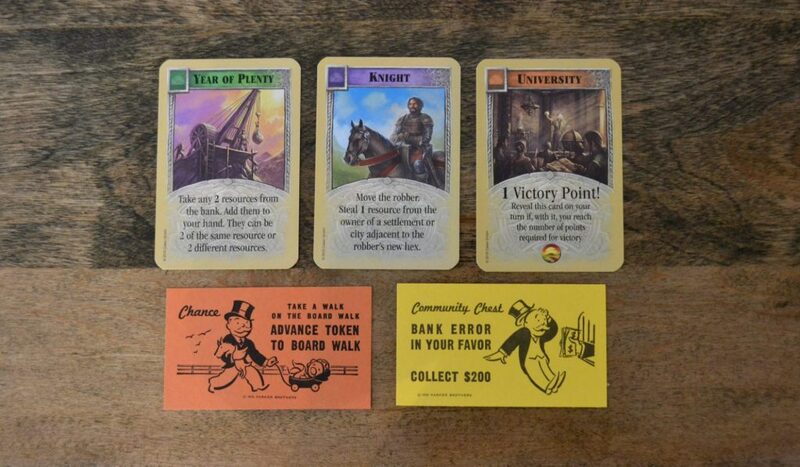 While chance and community chest cards have the possibility of hurting a player, they often will provide some sort of bonus such as money, or moving a player. For this reason, you can compare development cards to chance and community chest cards. Get out of jail free is kind of like a knight, both cards can help you get out of a bad situation. Here are some examples of cards which give players similar bonuses. Something that non-board gamers probably won’t be used to is having to sit down and learn the game. Those of us who play a lot of games are thankful for the poor soul who reads the rule book and shares their knowledge with us. Your non-gamer friends may be less than grateful. To get around this I suggest finding the shortest video you can that still manages to give them the basics. For my newcomers to Catan, I used Cameron Harris’ video ‘How to Play Catan’. While a short video may not go into every fine detail and answer all your friends’ questions, it gives them an initial overview of the game and gets them excited to play. Once the game is set up, quickly remind your friends of the key rules and ask if they have any questions. Then it’s time to start. If you want to learn how to become a better board game teacher there are ways to do that, but practicing on your newbie friends probably isn’t the best strategy. While you’re playing, provide helpful tips without over explaining. Tell them why you selected your starting settlements and guide them away from making decisions that will cause them to do so poorly that they won’t have fun. Do not, I repeat, do not destroy your friends; remember, this is their first real board game and if they lose horribly they may never want to play games again. Tragedy! Let’s be clear here, I’m not saying let them win, just don’t be cruel. If they are trying to decide between two options, explain what you would do and the costs/benefits of each choice. What if they’ve already played Catan? How do you convince them to leave their newfound island of comfort and reach out into the exciting world of trains, farming, and beige cubes? Many of the of the above suggestions still hold true, but now instead of using Monopoly as a reference point, link their next game to Catan. If their favourite part of Catan is building up a big engine, show them a simple engine builder like Splendor. Or if they are that one friend that always loses because their entire goal is to have the longest road, it might be time for Ticket to Ride. Different people will have different things that they really like about a game. Find out what their favourite part is and suggest a game that is simple and has a similar mechanic. Don’t forget the tips from above for teaching the game and giving them a fair chance. Maybe their favourite childhood game wasn’t Monopoly, and they haven’t played Catan. Well by now you may have figured out that it is actually pretty easy to find something, however weak, to connect their “favourite game” with one that is actually fun for you to play. Do they love solving the mystery in Clue? Perhaps the thrill of Mysterium might just be for them. If they enjoyed dominating the world in Risk you could try showing them a game where they can get a thrill out of rolling dice like Can’t Stop, or where they can conquer other territories like Ethnos. For someone that really loves Scrabble, there are many modern word games. Your Scrabble fan may find the secret drawing and placement of tiles in Ingenious strangely familiar, or they may think up the cleverest clues in Codenames. Really the options are endless… you just have to find a way to Connect 4, I mean Drop It, I mean connect them. For more examples of games you can use to “level up” your friends, check out our Board Game Step Ladder Series.